About a decade ago we started the Ministry Resource List. At first it was just an Amazon Wishlist, but eventually, to make sure Caesar was happy, we had to go a different way so as to cross all the demanded t’s and dot all the demanded i’s. In any case, the MRL has been a vital part of my research and work, and, I’ll be honest, a massive source of encouragement. Some folks just like to be able to do something “tangible” in assisting with projects and ministry outreaches. We have found that often those who give through the MRL do not give otherwise. For a while the MRL has been a hit-and-miss project due to the things I have been working on, debates I have been doing, etc. Back when I first started studying Islam the MRL was vital in building the library that has allowed me to pursue that work for a decade now. Today we are placing nine resources on the MRL, all associated with my new project in the field of textual criticism. 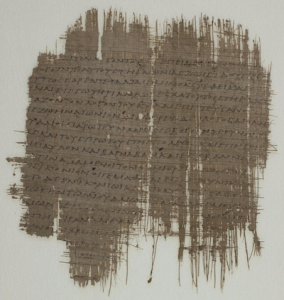 I have not been able to be nearly as specific in discussing the project as I would like, but it involves the in-depth study of one particular early papyri manuscript, 픓45. [At this point I learned something to take to heart: never, ever, ever write in the WordPress edit window. Write in a text program, then insert and edit as needed. I wrote this entire article, hit “publish,” and from this point onward, since I had gotten all nice and fancy and had inserted the proper Fraktur “픓” for the papyri symbol, and super-scripted the number 45, WordPress deleted everything from that point onward—totally unrecoverable. So I am trying to pretend that I am thankful to once again learn this rather obvious lesson for the 4,000th time!] 픓45 is an early third century manuscript containing fragmentary portions from the Gospels and Acts. What is very important is that the sources from which the scribe drew differ in portions of the manuscript. This opens a window into the available text types around the year AD 220. I well know that the materials we are placing on the MRL are quite expensive. Most are not available in libraries in the Phoenix area. I could, of course, obtain their use for brief periods of time through other means, but this raises the issue we are facing: I do not believe I have the freedom to materially curtail the work Alpha and Omega is doing through the DL and conferences and debates and the like. I need to keep the DL going, need to keep addressing a wide variety of issues, and so I need to have these resources at hand so that, when I can invest time in the project, they are there, ready to go. Further, even once the project is completed, these resources will be vital for the continued work in defending the veracity of the NT against both secular and religious opposition. I can only promise to seek under God’s guidance to be a good steward of these resources. Given how the list is set up now, you can give even a small amount toward the cost of these materials, and every bit truly helps. Thank you for considering being a part of this ministry in a very material and tangible fashion!